i. On Wednesday we had a meeting to present and discuss our initial ideas for the research paper. Jo often asks me to question the contemporary relevance of my practice so I have decided that I want to write my essay about two of my favourite artists at the forefront of contemporary portraiture: Chantal Joffe and Lynette Yiadom-Boakye. It was suggested that I try to arrange interviews with both artists (coincidentally someone on my course told me that Chantal Joffe is her neighbour!) and, although I need to specify a question in the next few weeks, the general ideas were well-received and encouraged. ii. The majority of Thursday was taken up with Symposium 2, a series of presentations by the second years about their current practices. It was fascinating and reassuring to see how much their work had developed and moved on since the first symposium back in October. iii. The symposium also reiterated the need to develop a 'project' (more specific and outward-looking than just portraits of friends and family) in order for my practice to have a focus and a purpose for the duration of the MA. On Tuesday I made a quick monotype of Jake from a recent trip to the pub. Making this and reflecting on my tutorial with Emma Stibbon last week, I have devised a plan for the next few months (although it could end up lasting longer). I am fairly itinerant at the moment (probably one of the reasons my work has been all over the place) and yet my local pub the Three Crowns is somewhere that I have a real fondness for, regularly make a point of visiting, and have made a few works about before. The Three Crowns is a traditional community pub full of weird and wonderful regulars and, in the same way that Alice Neel depicted the citizens of her New York neighbourhood or Leon Kossoff painted his son's swimming pool, a series of works based on its everyday goings-on and inhabitants might be a project that I can really get my teeth into. iv. 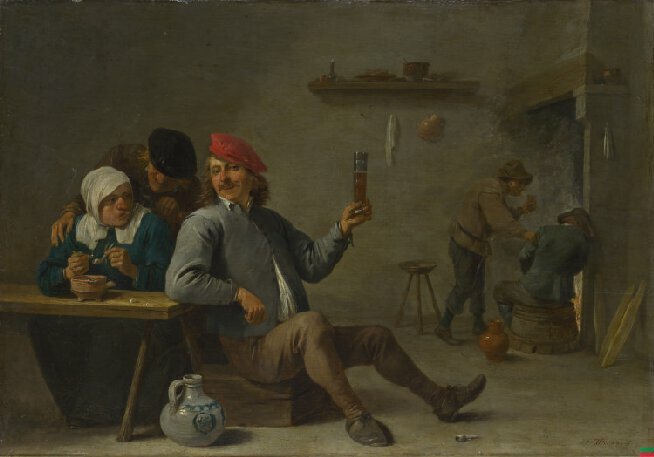 I then went to visit and draw from Teniers the Younger's A Man holding a Glass and an Old Woman lighting a Pipe at the National Gallery in a room devoted to 'Scenes of Everyday Life'. I can't wait to further explore Dutch tavern paintings, Michael Andrews' paintings of the Colony Room or contemporary paintings and prints of pubs and bars by artists such as Alice Macdonald and Ben Westley Clarke. Contextually it is going to be a rich and exciting project! v. I have arranged to rejoin Bath Artist Printmakers next week and plan to spend two long days next week churning out some initial monotypes based on photographs and sketchbook drawings of the Three Crowns.